Want to be notified of new releases in kimwalisch/primesieve? primesieve is a program and C/C++ library that generates primes using a highly optimized sieve of Eratosthenes implementation. It counts the primes below 10^10 in just 0.4 seconds on an Intel Core i7-6700 CPU (4 x 3.4 GHz). primesieve can generate primes and prime k-tuplets up to 2^64. primesieve generates primes using the segmented sieve of Eratosthenes with wheel factorization. This algorithm has a run time complexity of operations and uses memory. Furthermore primesieve uses the bucket sieve algorithm which improves the cache efficiency when generating primes > 2^32. primesieve uses 8 bytes per sieving prime, hence its memory usage is about bytes per thread. The primesieve console application can be installed using your operating system's package manager. You can also download the latest primesieve console and GUI applications from the downloads page. (< 2^64) using the segmented sieve of Eratosthenes. Below is an example with the most common libprimesieve use cases. primesieve's functions are exposed as C API via the primesieve.h header. 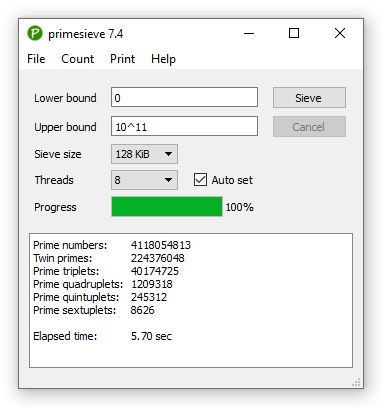 By default libprimesieve uses multi-threading for counting primes/k-tuplets and for finding the nth prime. However primesieve::iterator the most useful feature provided by libprimesieve runs single-threaded because it is simply not possible to efficiently parallelize the generation of primes in sequential order. Subdivide the sieving distance into equally sized chunks. Process each chunk in its own thread. Combine the partial thread results to get the final result. The C++ example below calculates the sum of the primes ≤ 10^10 in parallel using OpenMP. Each thread processes a chunk of size (dist / threads) + 1 using its own primesieve::iterator object. The OpenMP reduction clause takes care of adding the partial prime sum results together in a thread safe manner. Many thanks to the developers of these bindings!